Trevor Noah just sat down for an interview with Ellen Degeneres after the gods of comedy decided to reward us mere mortals for our good behaviour this week. The host of The Daily Show has been mingling with some of the biggest names in television over the past week. Last week we wrote about his entertaining and thought-provoking interview with Oprah Winfrey. A few days later he sat in Stephen Colbert's chair and completely flipped the script on The Late Night Show. And now, the funnyman has taken a moment to sit down with Ellen for one of TV's most entertaining interviews ever. One of the most interesting excerpts of their interview came when Ellen asked him about his interview wishlist. One person who did not make the list is president Donald Trump. 35-year-old Trevor openly admitted that he was no longer interested in sitting down with the 45th president of the United States of America. "'Watching his interviews for the past few years, I understand what's gonna happen: I'd interview him, he'd tell me how well he's doing. I'd ask him about something, if he doesn't know the answer he'd make an answer up. If he doesn't know what's happening, he'd say, "I'll get back to you." "I want to know if her #BeBest anti-bullying campaign online is a long-term dig at her husband - I genuinely want to know that. She is my new dream guest." 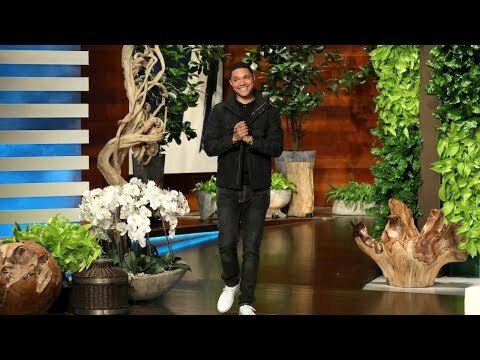 The full interview with Trevor Noah on the Ellen Degeneres Show airs this afternoon in the USA so we can imagine it will be airing in South Africa before the end of the week.